It is a box-type cooker with a central oven around which there is plenty of insulation. 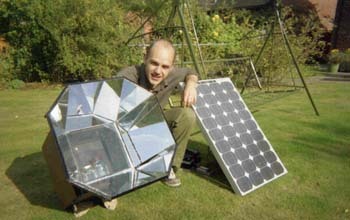 One side has a glass front and the mirrors channel additional sunlight into the box. The mirrors slope at approximately 45 degrees. A potato and a carrot were cooked over the course of about 3 hours on a bright October day, with an average of approximately 90°C being maintained. More testing and data logging is required to see how well it performs.